Save up to 30% everyday! Take the guess work out of sending a word of encouragement to members of your church or keeping in contact with friends and family. 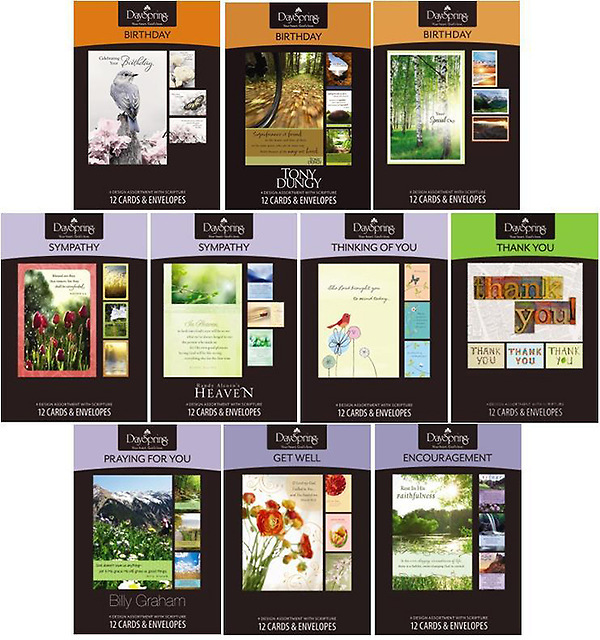 This card assortment offers you a wide variety of sentiments for all occasions as well as everyday savings - up to $45 off regular retail. The assortment includes 3 each of 40 designs that come in full color boxes that stack and store easily for greater accessability. Each card features a meaningful Bible verse along with a kind sentiment and space for a personal note to let them know you care about them. 4 1/2" x 6 9/16"
Do you have a large church or family to stay in touch with? No problem. The more you buy the more you save. Get your hands on these great cards for as low as $0.32 a card! Save up to 30% off our regular Everyday Boxed Card prices!